The following plots demonstrate the impact of the number of clusters and number of samples on various clustering performance evaluation metrics. 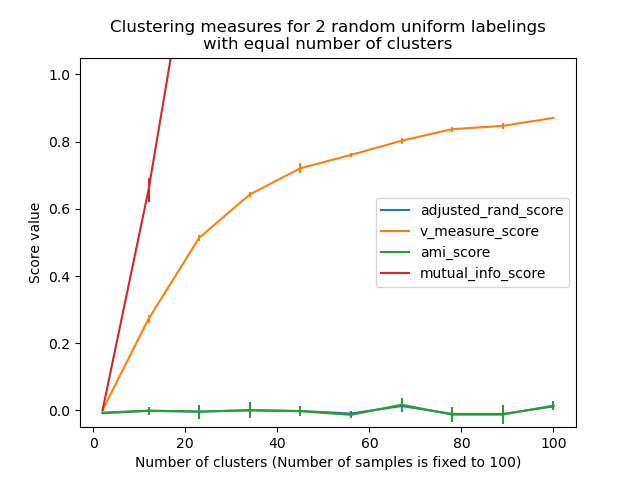 Non-adjusted measures such as the V-Measure show a dependency between the number of clusters and the number of samples: the mean V-Measure of random labeling increases significantly as the number of clusters is closer to the total number of samples used to compute the measure. Adjusted for chance measure such as ARI display some random variations centered around a mean score of 0.0 for any number of samples and clusters. Only adjusted measures can hence safely be used as a consensus index to evaluate the average stability of clustering algorithms for a given value of k on various overlapping sub-samples of the dataset. """Compute score for 2 random uniform cluster labelings. truth class assignment with fixed number of classes. 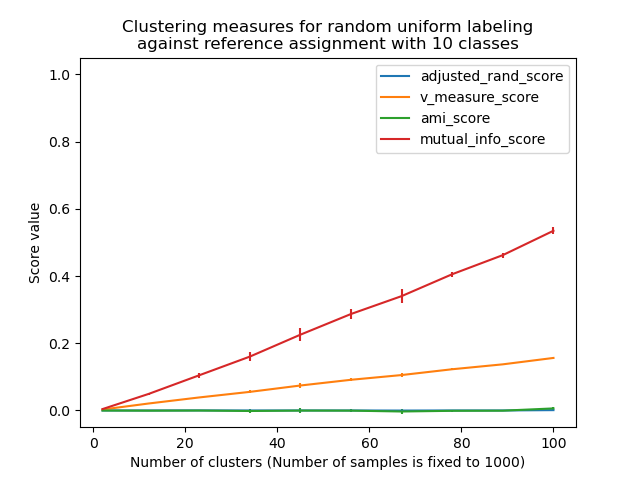 print("Computing %s for %d values of n_clusters and n_samples=%d"
plt.title("Clustering measures for 2 random uniform labelings\n"
plt.title("Clustering measures for random uniform labeling\n"